The new global shutter technology enables high-precision imaging and of high speed moving object. In addition, fine motion sensing is realized by variable shutter sensitivity control in various scenes. Osaka, Japan - Panasonic Corporation today announced that it has developed a new highly functional global shutter technology for CMOS image sensor using organic photoconductive film (OPF)*1. This technology enables to capture high speed moving object up to 10 times brighter*2 scene in global shutter mode. In OPF CMOS image sensor, charge-storage function and photoelectric-conversion function can be set independently. By utilizing the unique feature of OPF CMOS image sensor, this technology solves the degradation of saturation signal in conventional image sensor with global shutter function. Motion direction can be detected from acquired object's signal level in one picture by fine control of shutter sensitivity by changing applied voltage to OPF which is hardly realized by conventional CMOS image sensors. The newly developed highly functional global shutter technology contributes to high speed image sensing of moving objects without image distortion which appears in conventional shutter operation under very bright scene. We expect this technology to be used widely in motion capture applications and also extend to other applications that have been thought to be difficult to realize unless high saturation global shutter or variable sensitivity multiple exposure. Wide incident angle (60 degrees), high sensitivity, high saturation and highly-functional circuits due to a unique feature of OPF, in which an OPF for photoelectric-conversion and a readout circuits are independent. High saturation signal up to 10 times larger*3 than conventional image sensors with global shutter function due to Photoelectric Conversion Controlled Global Shutter Technology. This development is based on the following new technologies. CMOS Image Sensor Design Technology, in that, an OPF photoelectric-conversion part and a circuit part can be designed independently. Photoelectric Conversion Controlled Global Shutter Technology that is realized by controlling of organic photoconductive film sensitivity. Variable Sensitivity Multiple Exposure Technology which can detect the motion and its direction by changing image capturing sensitivity in each frame. Panasonic holds 60 Japanese patents and 41 overseas patents (including pending) related to this technology. Panasonic will present part of the research at the international conference ISSCC (International Solid-State Circuit Conference) 2016 which is to be held in San Francisco, USA on January 31 to February 4. *1: We are using an organic photoconductive film (OPF) that FUJIFILM Corporation has developed. *2: Saturation signal per pixel area, compared with conventional silicon based CMOS image sensor with global shutter function. 1. The OPF CMOS Image Sensor Design Technology, in that, photoelectric-conversion part and a circuit part can be designed independently. The conventional image sensor consists of a silicon photodiode for capturing light, metal interconnects and an on-chip micro-lens. And, both a photoelectric-conversion function and a signal charge-storage function are executed by a silicon photodiode. On the other hand, in an OPF CMOS image sensor, a photoelectric-conversion function is executed by an OPF, instead of a silicon photodiode, and a signal charge-storage function is executed by circuits beneath the OPF. Both functions are almost independent, so an OPF CMOS image sensor can achieve the following features. Expansion of the incident light range to 60 degrees and reproduction of faithful color. An OPF with high optical absorption coefficient, instead of a silicon photodiode, is adopted, the thickness of an OPF has been reduced to just 0.5 microns, four to six times thinner than silicon photodiodes. Since the conventional silicon photodiode needs at least 2 - 3 microns in depth, the range of incident angles was limited to around 30 - 40 degrees. An OPF, achieved with the OPF CMOS image sensor technology, has enabled the expansion of this range to 60 degrees, efficiently utilizing light entering at an angle for faithful color reproduction with no color mixing. It also gives greater flexibility in lens designs, facilitating the reduction of overall camera size. Boost of sensor sensitivity by 1.2 times compared to conventional silicon image sensors to deliver clear images, particularly in dark conditions. The transistors and metal interconnects in each pixel, fabricated using Panasonic's semiconductor device technology, are coated with an OPF. The area of the light receiving section becomes limited in conventional image sensors because of the existence of metal interconnects and the need to form a light shield film to prevent light incidence into areas other than the photodiode in each pixel. 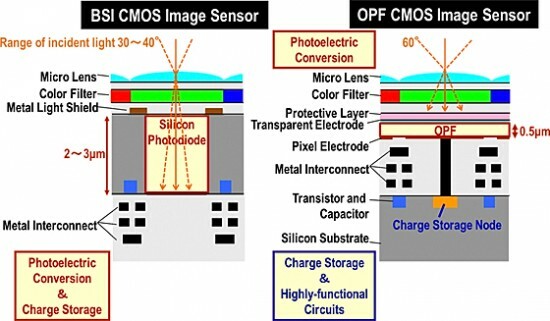 However, an OPF CMOS image sensor technology coats the sensor with an OPF, which can harvest all the light received on the sensor. This unique structure and high quantum efficiency of OPF boosts sensor sensitivity by 1.2 times compared to conventional silicon image sensors to deliver clear images, particularly in dark conditions. In the architecture of an OPF CMOS image sensor, the OPF, that converts light into electric signals, and the circuits, that store electric signal charges and readout electric signals, are designed completely independently. Therefore, by selecting an OPF, photoelectric-conversion characteristics, wavelength, sensitivity, etc., can be set with flexibility. Moreover, in conventional image sensors, it is necessary to place both a silicon photodiode and circuits (transistors and capacitors) on silicon substrate in each pixel, so an area of circuits is limited. On the other hand, in an OPF CMOS image sensor, it is not necessary to place a silicon photodiode, so high-performance circuits, such as high-speed or wide dynamic range, can be formed on a silicon substrate. In particular, in an OPF CMOS image sensor, by providing a large capacitor for storing signal charge, a saturation value of electric signal can be significantly increased from conventional image sensors. 2. Photoelectric Conversion Controlled Global Shutter Technology that is realized by controlling of organic photoconductive film sensitivity. Conventional CMOS image sensors with global shutter function require storage located near photoconversion area which makes it difficult to simultaneously shrink the pixel size and enlarge the saturation signal. Developed "Photoelectric conversion controlled global shutter technology" realizes shutter function by controlling of photoelectric conversion efficiency by only modulating applied voltage to OPF, without additional in-pixel circuit and no degradation of saturation signal. And developed "high saturation pixel technology" by pixel gain switching operation can capture under extremely bright scene, up to 10 times or more saturation signal per unit square pixel than conventional CMOS image sensor with global shutter function. This technology will solve imaging problems caused by rolling shutter distortion, flash bands and LED flickers in very bright scene. 3. Variable Sensitivity Multiple Exposure Technology which can detect the motion and its direction by changing image capturing sensitivity in each frame. Conventional multiple exposure cannot detect the direction of motion because the capture sensitivity is fixed. Panasonic have developed "variable sensitivity multiple exposure technology" by controlling the voltage applied to OPF with elapse of time, which is hardly realized in conventional silicon based image sensor. We can get several images of different exposure time and different exposure sensitivity in one picture that enables character recognition by choosing optimum exposure time, so direction of motion can be detected by acquired object's signal level. This technology enables sensing of moving object detection and motion directions. Global shutter: Shutter operation which can capture the image at the same time in all pixels. Ordinary CMOS image sensor operates in rolling shutter mode in which exposure and shutter operation is executed row by row. Saturation/Saturation signals: Maximum amount of electric signal that can be handled by image sensors. Receiving a signal greater than this value leads to highlight clipping. Optical absorption coefficient: A constant value that indicates how much light is absorbed into a material, when incident light enter to the material. Flash band: stripe shaped contrast appears in captured image, because light flashes during image sensor capture the image row by row pixel (rolling shutter operation). LED flicker: Imaging phenomenon resulting in incomplete image capture, caused by a LED's (traffic, headlights, signs, etc.) frequency and a camera's imaging speed. This entry was posted in Fuji, Panasonic and tagged Panasonic sensor. Bookmark the permalink. Trackbacks are closed, but you can post a comment.